Home Uncategories Review TV show Colors Mahakali: Anth Hi Aarambh Hai. 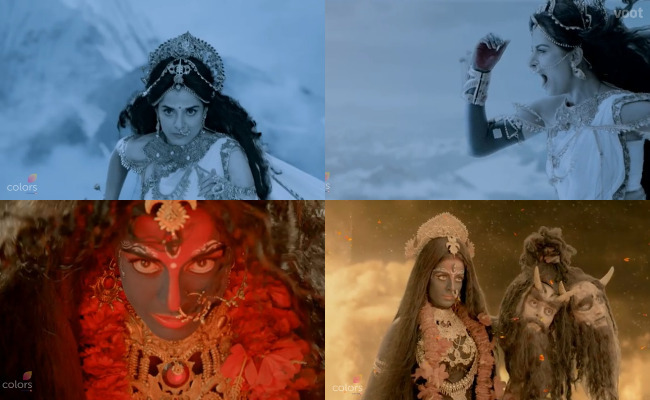 In a time where Mythological shows are barely maintaining their TRP ratings, Colors brings its latest offering, Mahakali: Anth Hi Aarambh Hai. Perhaps its deliberate or just good timing, but the channel couldn't have chosen a more relevant subject for the current times. The Pooja Sharmaa starrer is all about Naari Shakti and the hidden motifs in mythology that prompt glance in retrospective. Mahakali doesn't beat around the bush. The show gets right into addressing it's core concept and begins with Parvati having a vision of a female warrior destroying an army of asurs. Disturbed by the vision she confides in Nandi (the holy gate-guardian) and approaches Shankar Mahadev. 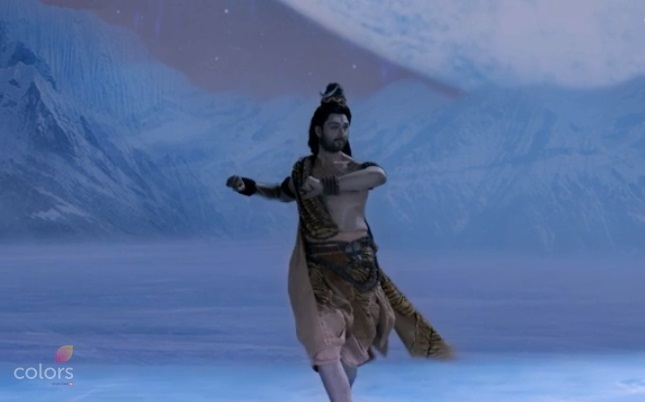 On Kailash Parvat, we are introduced to Lord Shiva (Sourabh Raaj Jain). Here, we have Lord Indra enter with his soldiers as they seek respite from Shumbh and Nishumbh, the asurs who have captured his kingdom. Here the asur Shumbh is shown a vision of Parvati and is smitten by her. He sends a messenger back to Kailash Parvat to strike a bargain. In the meantime, Parvati is in search for the warrior in her vision to end the war. She approaches Lord Vishnu (Karan Malhotra), where the latter and his wife tell her that the warrior she seeks is probably very close to her and she assumes its Goddess Lakshmi. Note: She assures Lakshmi that power doesn't come from position or being someone's wife, its your individual shine that makes you powerful. Parvati is constantly aware of her being mortal as she encourages the goddess for finding the warrior in her not realizing it applies to herself. Back in Kailash Parvat, an unarmed messenger from the Asurs arrives, who tells Parvati that they only want peace at the cost of a sacrifice as women are born just to sacrifice for men and her mortal sacrifice will keep all Gods safe. 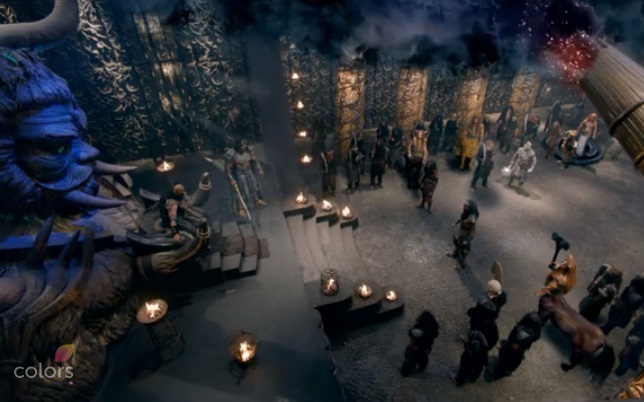 He proposes that she leave Kailash and marry Shumbh as for DevLok's throne, sacrificing a mere woman isn't a big deal. Parvati lashes back and we see an assertive streak. When she goes to Mahadev with this new grievance he doesn't react angrily but says its time for him to go in meditation stating that "a battle won with help is called a sympathy call, you need to fight your battles, i don't want my wife to be helpless". Frustrated by this response she appeals to Goddess Lakshmi again. This time an asur is sent to drag Parvati to Shumbh's palace. In her quest to find the female warrior the goddesses agree that it must be Narsimhi Devi (lioness form) and a war begins with the asur's arrival. In this war the demons openly challenge the feminine position calling them sacrificial lambs and beings who should be confined to the bedroom and the kitchen. Here, when Parvati's near ones are attacked and the transformation begins. She takes on the form of Goddess Kaali, while Shiva worries if her power will be too strong to be controlled even by him. Pooja Sharma's performance is commendable, she shows all the traits Parvati is heralded for in mythology and does full justice to her character. Her antagonists instigate her at every step and the plot constantly moves head questioning feminine strength and then giving us all the right answers to those questions. What we like is how the same actress portrays a non-assertive and an assertive character at the same time. With the makeup and effects, the actress completely transforms, which makes it fun to watch. We were particularly moved by the scene where she addresses the other female goddesses (with Falaq Naaz and Nikita Sharma playing Goddess Saraswati and Lakshmi) and tells them she represents the anger and courage within them. Born of the rage of the "abla naari" Kaali becomes an apt representation of power. Another element we enjoyed is the dialogues, mainly the riddles and metaphors- "for the arrow to flow, the bow has to be set aside just the way a man must step aside to let the woman take over" and "janm Hota hai aur mrityu Hoti hai" stressing on the female verbs and using clever wordplay to counter Chand and Mund's claim that women come after men. The most looming problem is how the CGI quality declines steadily with time. We see a lot of sloppiness in terms of effects. The settings and the manner in which the supernatural powers are shown on screen looks mostly unrealistic. We won't spoil much, but there is a scene where she slays demons and while she's at it, drinks the blood that spills and leaps right into her mouth. Another problem we can think of is, how often the dialogues spell out precisely what the scene is about. Given that an Indian audience knows most the age-old tales, the makers shouldn't have gone around stating the obvious. We don't hate it, we just wish the makers wouldn't handle the audience with kid gloves and give us mytho-fiction that retains intrigue. Mahakali gives away way too much too soon. Within the first 10 mins we hear Sourabh Raaj Jain mouthing "anth hi aarambh hai". They spell everything out for you and two episodes already look like the end of a saga. Considering the run time we wonder how long the makers can keep it up. We like how Pooja Sharma goes from Parvati's Gauri avatar to Kaali and owns it along with the attention given to some props and detailed motifs in costumes. But, the sloppy shots of battle fields, blurred edges and settings that looked like they were made in a hurry take a lot away from that praise. Also, can the series survive riding on the shoulders of its impressive female protagonist? Only time will tell. ek dum bakwas serial , gatiyapan se banaya gaya . 1% humien nahe laktha k hum mahakali serial dekh rahe hai , its more a childrens timepass serial . serial banane wallo pehele serial banana sekhlo ,phir kuch karna . aur wo shiv ka trishul ,. disgusting , completely meant for childrens . kuch sekhna hai tho devon ke dev mahadev se sekho .